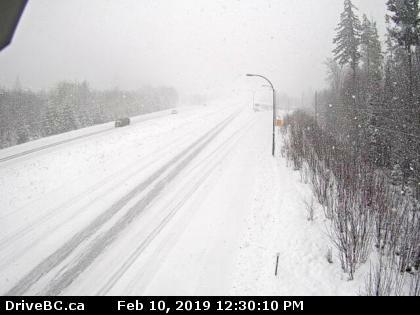 Highway 19 near Buckley Bay on the afternoon of February 10th, 2019. Image sourced from DriveBC. COMOX VALLEY, B.C- Heavy weather is rolling through the Comox Valley. While there have been no warnings issued by Environment Canada, high winds and blowing snow are impacting roads across the region. To the north and south ends of the Valley, Highway 19 appears to be heavily impacted by the snowy conditions. Drivers should travel according to the conditions, and take all precautions.